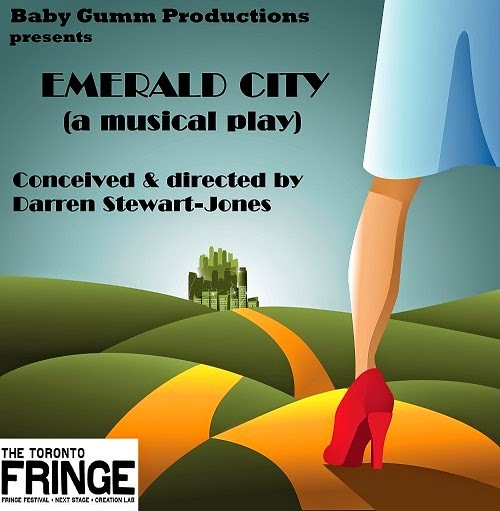 In the 75th anniversary year of MGM's classic film version of The Wizard of Oz, we are bringing a sort of sequel, Emerald City, to the 2014 Toronto Fringe Festival. Follow Dorothy and her friends as they take a detour off the yellow brick road and find themselves in group therapy with Dr. Oz, Psychiatrist, dealing with life in the Emerald City one step at a time. Conceived and directed by Darren Stewart-Jones, Emerald City is based on characters created by L. Frank Baum and features music from the American Songbook of the early 20th century. Emerald City - a musical play, has an incredible cast of young talent. Dorothy will be portrayed by Christie Stewart, who was previously chosen as a Top 20 finalist for the role of Dorothy on Andrew Lloyd Webber's CBC television series Over The Rainbow. The show also features Matthew Fuller as Tin Man, Chris Vergara as Scarecrow, Dillan Chiblow as Lion and Rory Bray as Glinda. We are thrilled to be at the Tarragon Theatre Mainspace for our run at Toronto Fringe. Join us for this incredible journey back to the Land of Oz. It's going to be "wicked"! Tickets are $10 at the door or reserve in advance online for $12 at FringeToronto.com or by phone at 416 966-1062.